A Republican legislator is targeting tenure for professors at the state’s three public universities. 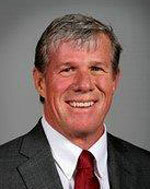 Senator Brad Zaun of Urbandale is sponsoring legislation that would end the tenure systems at the University of Iowa, Iowa State University and the University of Northern Iowa. “It’s unfortunate that universities out there, if they have a bad professor, they can’t get rid of that professor because of the tenure,” Zaun says. Critics of Zaun’s proposal say professors can be fired for cause and they argue tenure ensures the universities attract the best and brightest to teach and conduct research. Zaun says he’s also “frustrated” by some of the sabatticals professors are being granted and the number of courses that are being led by grad students rather than professors. Zaun has sponsored this bill to end tenure in past years, but now Zaun and his fellow Republicans are in control of the debate agenda in the legislature. Under most tenure systems, a professor must work at the same university for at least seven years before being considered for a contract that offers tenure. Supporters say tenure simply ensures professors get “due process” when there’s a dispute with university deans or managers. According to a Board of Regents report released in April, 38 percent of University of Iowa faculty have been awarded tenure, while about half of Iowa State and UNI staff have tenure.